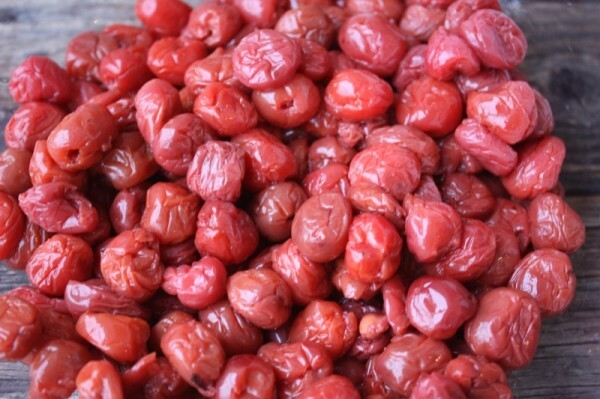 Sour or Tart Preserved and Dried Evans Cherries inspired by Connie deSousa! 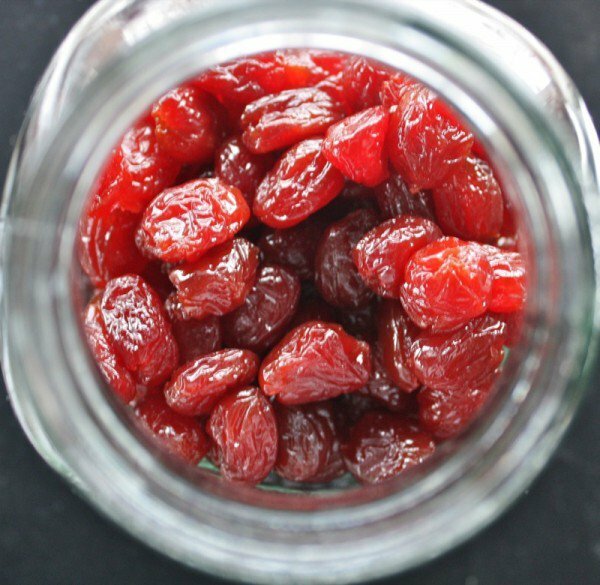 My Preserved or Dried Evans Cherries are unforgettable! Vanja and I finally made it to CharCut the night before New Year’s Eve: an unforgettable food experience. 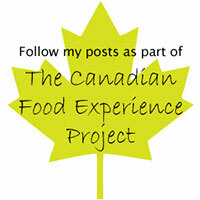 I followed Chef and owner Connie DeSousa throughout Top Chef Canada where she was a finalist. I knew she was good… but had no frame of reference as to “how good”. Connie is, without question, a Local Food Hero. 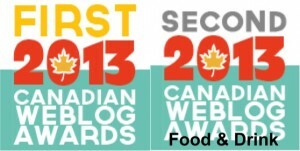 She is also, without question, a Canadian Food Hero. Her food is basic and brilliant. She walks her talk in the most humble shoes. We sat at the bar watching her pirouette through her kitchen. Her evening performance was seamless and unmistakably delicious. One of the many tasty morsels we were served that evening was her preserved sour cherries. There were a few on the Chef’s Charcuterie Platter and again in the luscious cheesecake dessert. Dense, tart, delectable with an inexplicable je ne sais quoi. I asked Connie what kind of cherry this was having no idea about the process it had gone through. Whenever you ask her a question, she has a story to tell. I love that. Her cherries came from her neighbour’s yard. 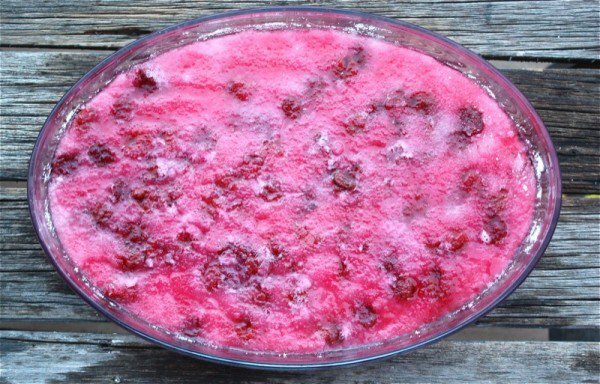 She had preserved them by covering them with vinegar for one week, straining them; covering them with sugar for the next week. Then, they are strained. 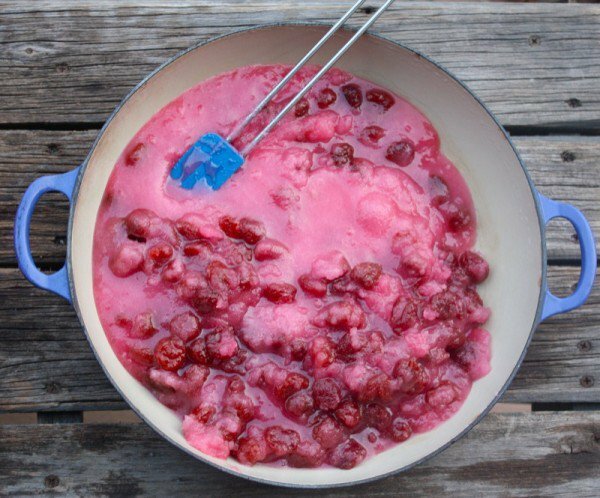 The syrup is used in their bar and the cherries paired with the charcuterie or in desserts. I was mesmerized. 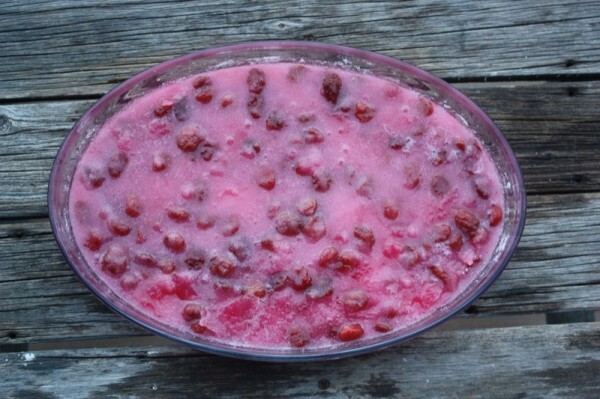 I had a deep freeze full of pitted Evans Cherries from the summer waiting for a little magic. 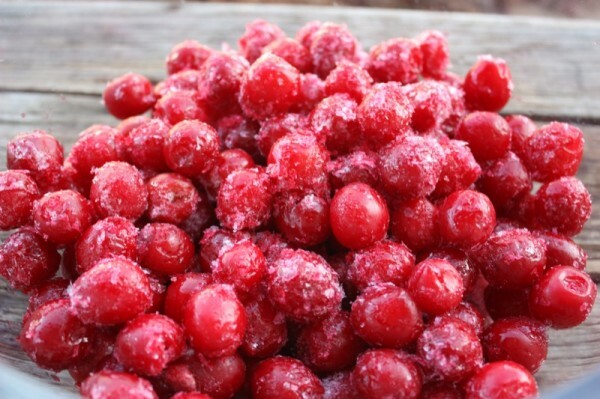 Immediately upon arriving home on New Year’s Sunday, out of the freezer came two bags of pitted and frozen cherries. I covered them with vinegar and let them sit in the cold for a week. I lost a little faith in my memory of Connie’s “recipe” when I saw how their colour after a week: an unappealing orange-brown – and when strained, limp, withered and lifeless. Oh, yes. I did taste one. No words. “Yuck” would not suffice. However, I decided to stick with the plan. I could succeed, or I could fail. Either way, I would learn something. 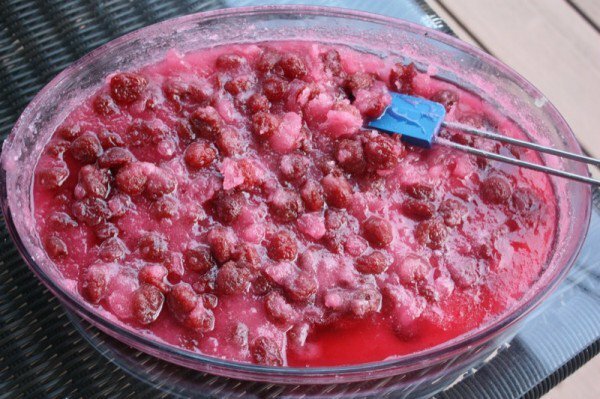 I covered the bottom of the dish with white sugar, added the first layer of cherries and covered it completely with more white sugar, added the remaining layer and covered it completely with more white sugar. I left them in a cold place for another week. Meanwhile, I had a lot of cherry vinegar. I hadn’t asked her what she had done with this. I tasted it. Oooooh, baby! No! There was a lot of cherry flavour and colour, but I had to add sugar so decided to make a sweet and sour type of sauce and see what happened. 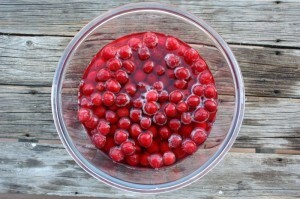 I a little sugar to the cherry vinegar, shook it well and it was spectacular. 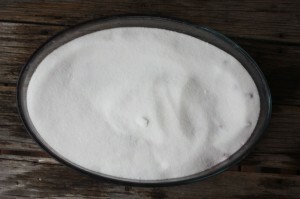 After three or four days, the sugar was turning pink, and I helped it along every day after that by stirring it once or twice a day. This is the mixture after 7 days in the sugar. I was completely on my own with determining next steps at this point. 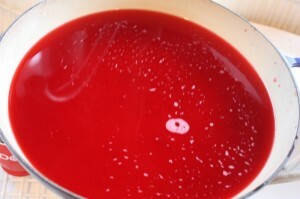 I decided to heat the ingredients slowly, melt the sugar, simmer for a bit to completely dissolve the sugar, then strain. Worried if my cherries would regain the gorgeous red colour Connie’s had. And the answer to that question? Yes! Yes! Yes, they did! Oh, blessed faith. I love new discoveries in the kitchen and taking risks that seem sensible when combined with what you already know. Oh, how delighted I was. 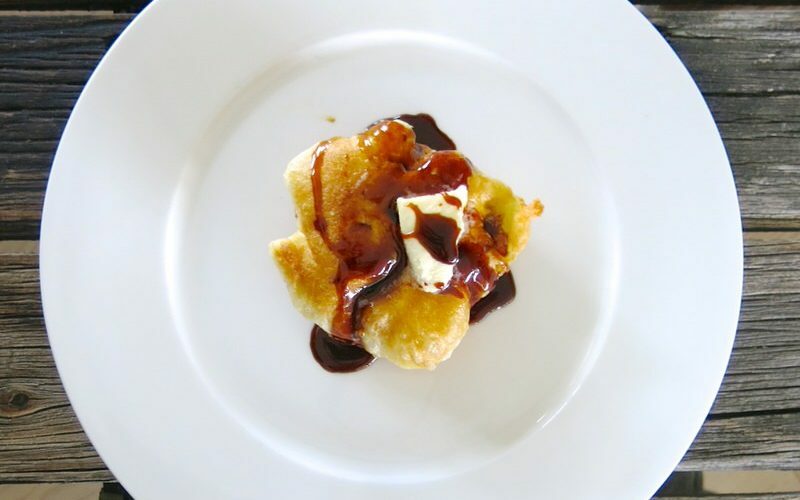 This syrup was lip-smacking sweet and sour gold. 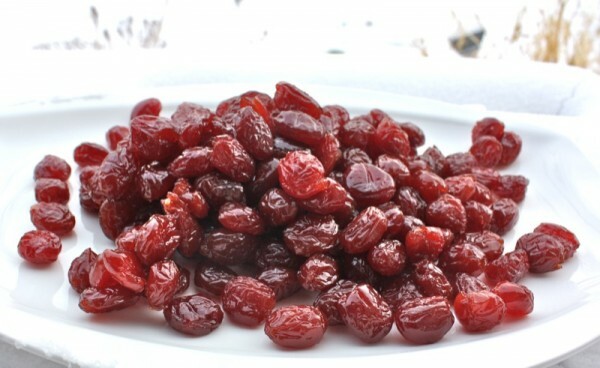 How much flavour would remain in the little fruity jewels? I did simmer-boil the syrup a bit more until it thickened a little. And the cherries? Again, completely winging it, I decided to lay them on parchment overnight. Some batches have taken only 12 hours, others 72 hours, but all have been spectacular in the end. Patience at this phase is key. I dried them for a couple of days on parchment paper. They were a little tacky, but not wet sticky. And powerful in flavour. 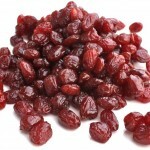 Each little morsel is dense and tart and chewy and sticky singing an operetta and hitting a multitude of high sweet and sour tart cherry notes sparkling the entire palate. You taste one and salivate immediately. They are addictive. 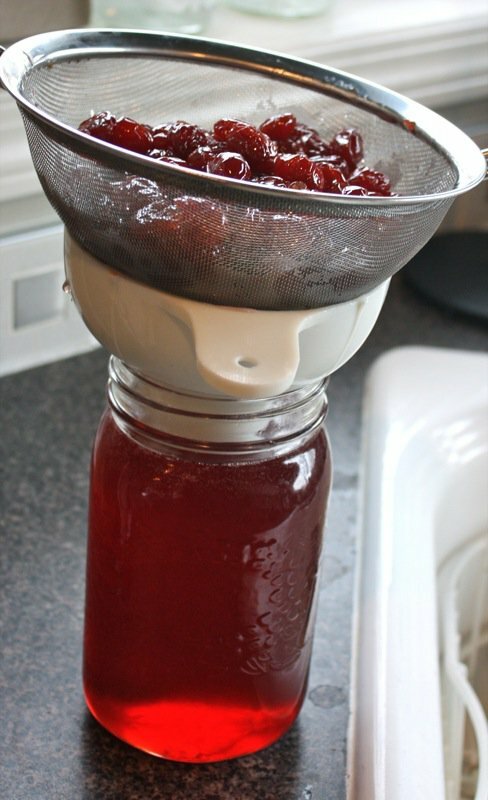 But, were too labour intensive to be eaten recklessly one after the other until we got our cherry pitter! That is my challenge because these are the best things I have ever eaten all year! 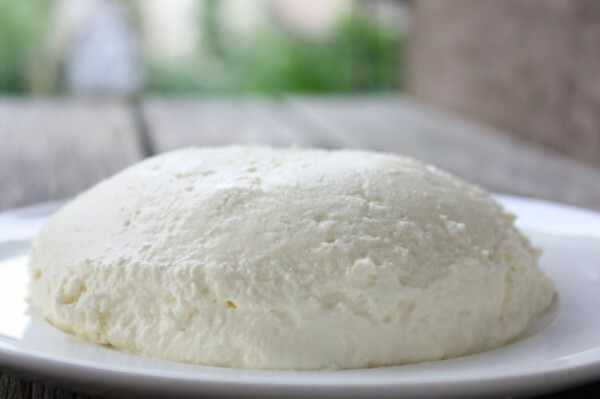 I freeze them in labelled dated bags and then all those bags inside another freezer bag and use them for the most special desserts or breads or garnishes. 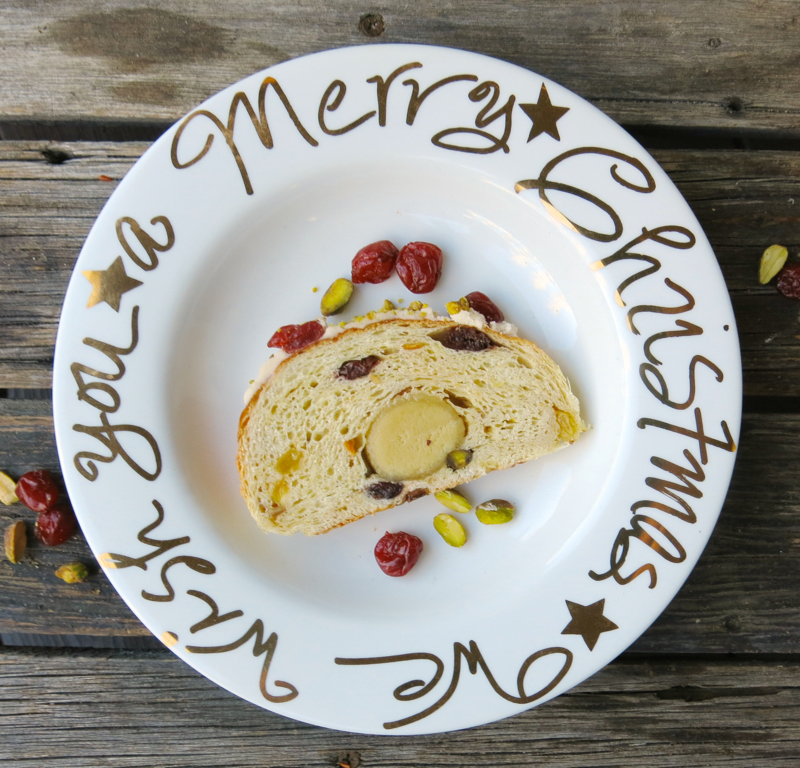 Above, Tart Sour Cherry Shortbread Ball and Mom’s Famous Christmas Stollen. 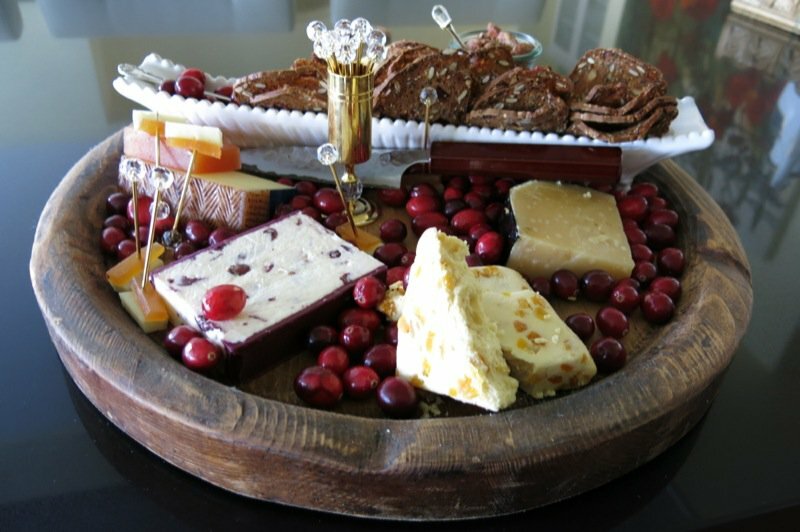 Below, a cheese platter with fresh cranberries and tart or sour preserved and dried Evans cherries and a Fresh Spinach Salad with Almonds and Dried Evans Cherries. I cannot wait to discover more and more and more uses for these precious jewels. 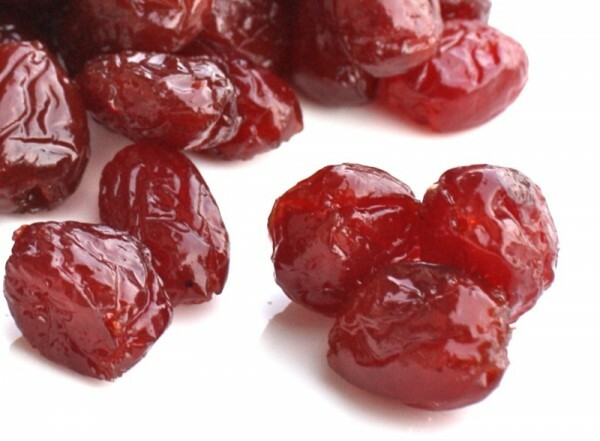 Preserved and Dried Sour Evans Cherries: Preserved Cherries, Cherry Vinegar and Cherry Syrup all from one recipe! 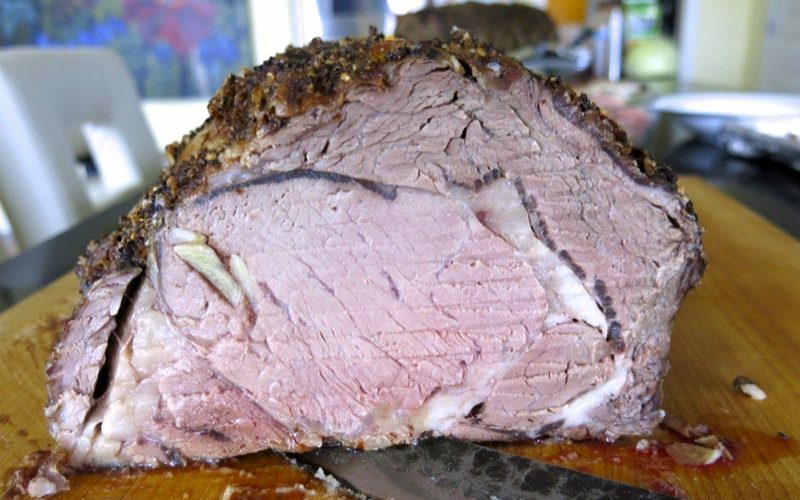 I am very proud of this recipe and it is most definitely one I am famous for in my neck of the woods. Everyone loves them, covets them and is tickled pink when gifted with a package of them. If I can do it, so can you! Let me know if you do! 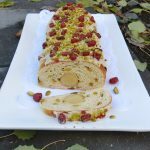 This recipe is a Canadian Food Original and has become a family specialty. Little jewels that are sweet, sour and full pucker-power! Preserved, then dried. Plump, juicy and lively. Oh Valerie, how interesting! I wonder if these are available in Australia. Oh my, those look delectable! 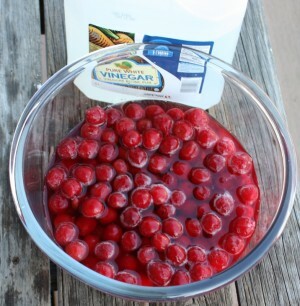 I going to try to remember to try this recipe when our Wisconsin cherries are in season again! i love it when a cook shares their recipe’s. i have never understood those who wont? these look absolutely gorgeous. 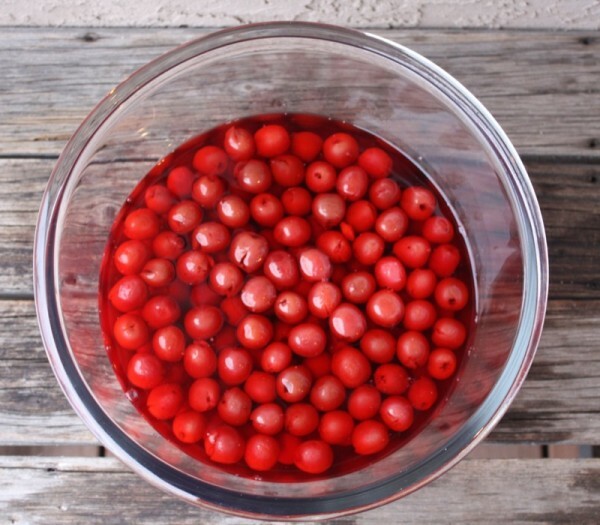 and of course my first thought is to mix with vodka…..
Every year I forget how gorgeous your cherries are. Sour cherry season can’t come soon enough! I love the sound of these. I’d be munching on them nonstop. Great work, Valerie! 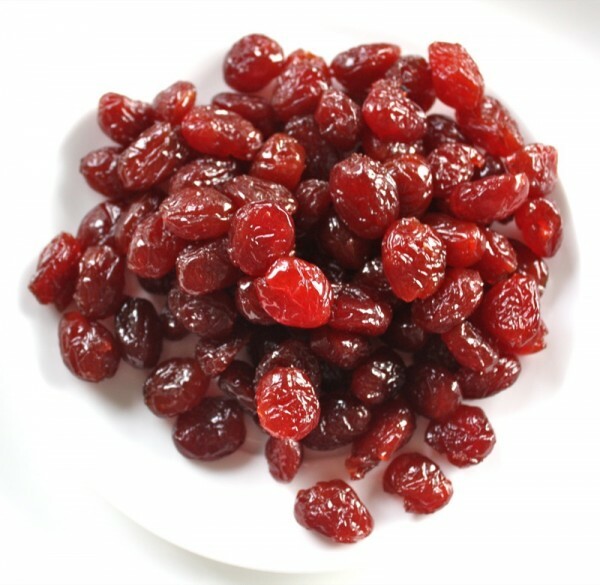 I wish that I had a bag full of cherries frozen in my house now… alas, I’ll just have to live vicariously and remember this next summer. What an awesome experience! I’m glad it was so worth the time and effort! Although time consuming, those look incredibly tasty! I wouldn’t expect anything less from Connie. She is truly an amazing chef (and role model to all aspiring female chefs out there) and Charcut is a great restaurant. Connie, I just stumbled on your blog and was i ever rewarded! 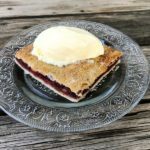 This sounds fabulous and I simply cannot wait for sour cherry season in NE Ohio. These are more delicious than I can describe. 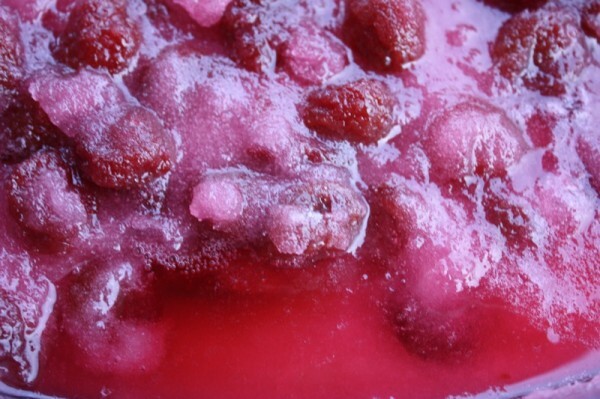 Each little preserved berry packs a powerful flavour punch! So glad you are enjoying my work! Okay this is by far one of the coolest things I’ve ever seen. I am a cherry fanatic so I am biased. I am also a Connie fan. Although I’ve not met or had her cooking. I bookmarked this one to try out myself. I adore experiments. This is a must try. These look amazing! 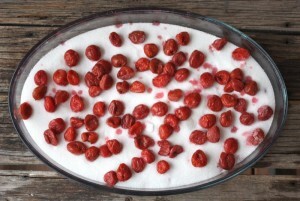 We have lots of evans cherries here so I will be making lots of this in the summer. I love-love-love it! 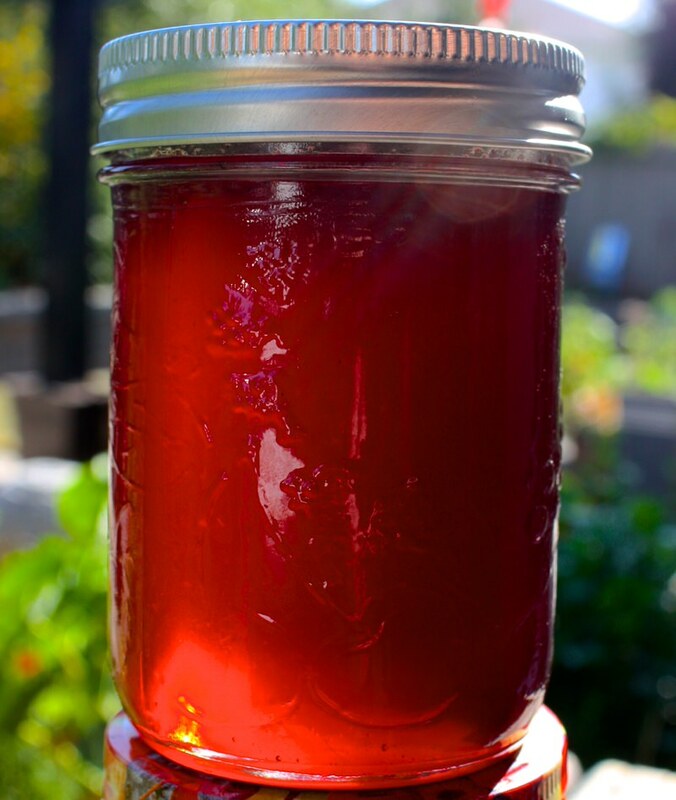 I’ve done a lot of preserving, but never heard of this one before. Thank you, I added it to my recipe book. Great blog, it’s in my favorites! Woah, thanks for sharing this little secret with us Valerie. I have it bookmarked since I am not lucky enough to have cherrie in the freezer. I stumbled on to this blog. Great information. I also have an Evans cherry tree. 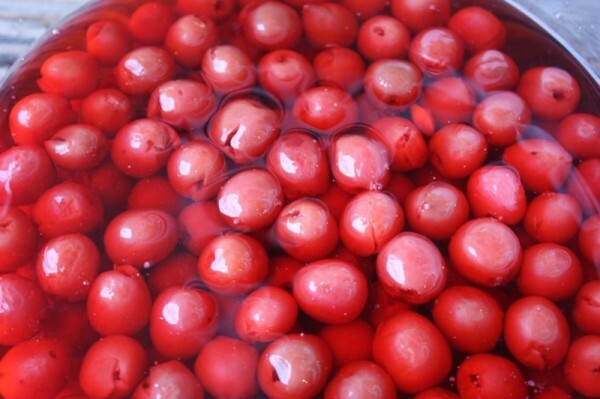 I sit for hours pitting the cherries for cherry pie and I also use some to make Cherry Liqueur for Christmas presents. 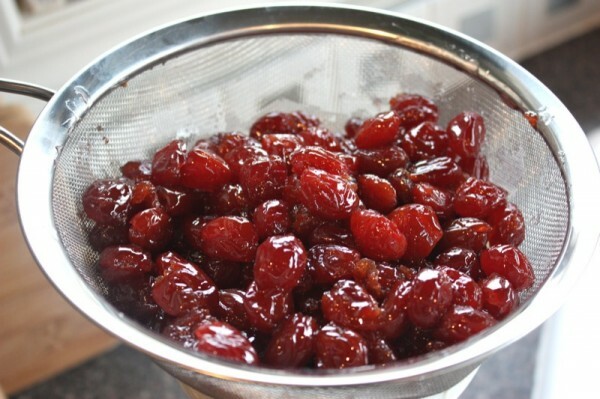 In the past I have always discarded the cherries after the liqueur was done. 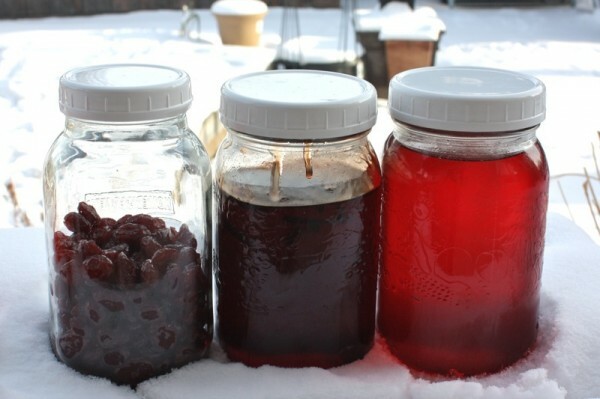 This year I froze the discarded cherries (pitted some)with hopes of making my own chocolate liqueur cherries. I did not get to it but I will. Great Article! I do the same think and thought that piling the sugar over them for a week might be a good try. I will do that with mine this year! 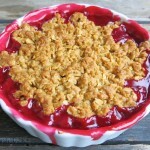 I would love to have your sour cherry pie recipe. Mine is good. I am looking for a great one! What a wonderful little secret from Connie! Thank you for sharing with me…and thank you for leaving sweet comments on my blog. They mean so much. I hope you are having a great weekend! 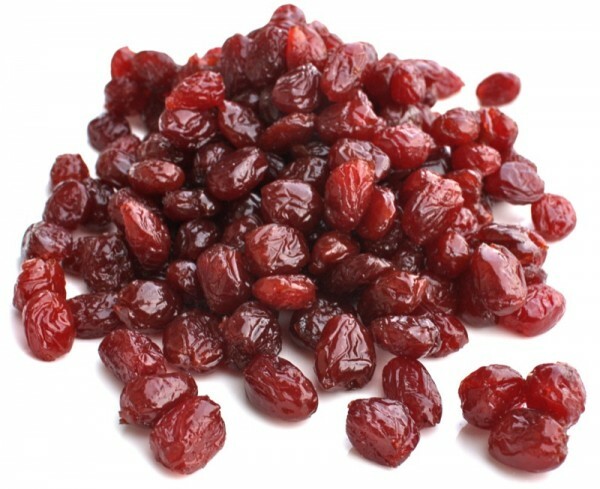 They are so powerful in their flavour – tangy, sweet, singing cheery in a high clear sweet tart soprano pitch. Addictive. This preservation technique for me is really an incredible discovery. These were sooo delicious!! As were both of the sauces!! Thanks for eveerything today, Valerie! Lovely to meet you at the Macaron Making Class today! These cherries were unreal, as was the sweet and sour sauce. 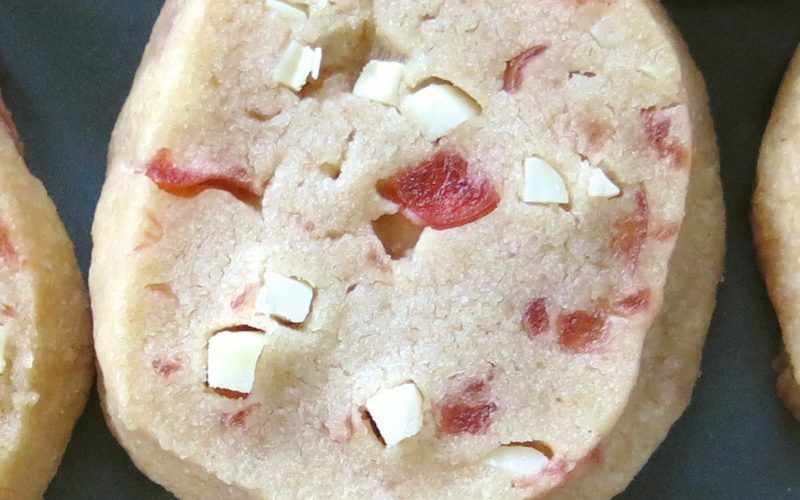 The fact that you shared a taste with your macaron making class (a bunch of strangers!) says so much about your generosity, Valerie. I’m sure I will want to keep the cherries all to myself when I make them with my tree’s bounty this year! Thank you, and I will be coming back to this post in August. 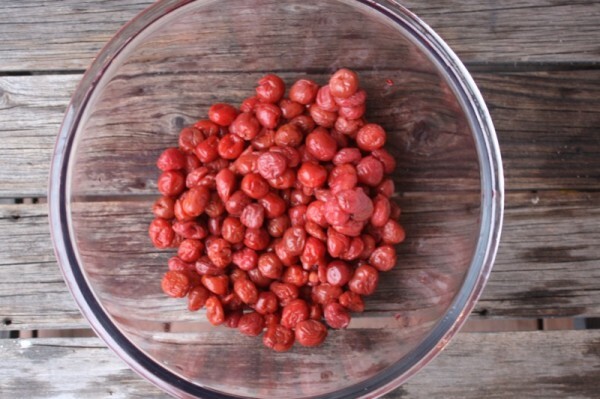 hi, I have a whole bucket of nanking cherries…do you think they would also work? If you pit them, they would work, but I would maybe do a cherry liqueur. They would be gorgeous in that, and no need to pit them. I finally made these. They are worth the wait! Soooo yummy and different! So happy you did this – not hard, but just takes patience, right!!! 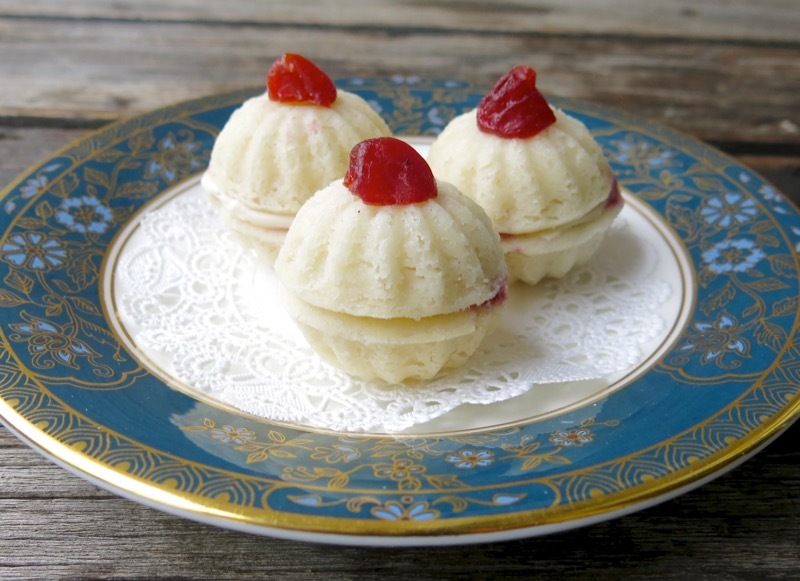 Thrilled the recipe worked for you and you loved them! 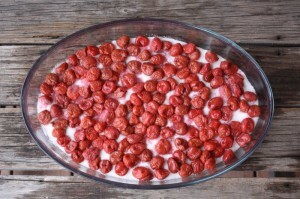 I still have many bags of Evans Cherries from last August and will try this right away. Can you tell me, did you thaw them before you started to soak them in the vinegar? 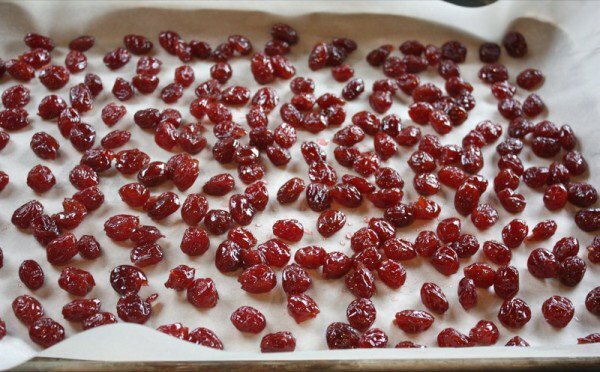 As long as they are frozen individually, and not in a sticky mass, you can start the process with the frozen pitted cherries. They must be pitted. Also, rub any freezer frost off of them first. Let me know how it goes! We love them. I know this was posted a very long time ago, but I just stumbled on it and they look amazing! I want to try it, but have a question……. by letting them sit in a cold place does that mean like in the fridge? It’s the middle of the summer here and the fridge is the only cold place. Also, did you dry them in a dehydrator or just let them sit out at room temp? HI Trina, no, it just means a cool place… like a basement or garage – somewhere not warm. 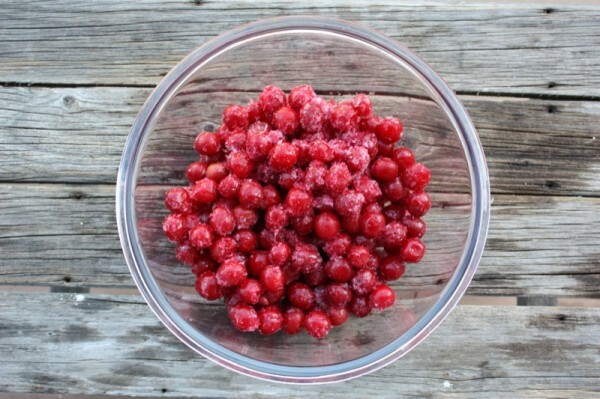 If the fridge is the only place, maybe pit them, freeze them and the recipe will still work at a cooler time of year. Also, I didn’t dehydrate them. Just set them out on the counter to air dry. They were still a little sticky to touch, but not too much. Scrumptious though. I make them every year and use them so many different ways! Let me know how it goes! Thank you so much for your reply….I didn’t know if I’d get one so long after this was written! 🙂 I already put vinegar on them so maybe I’ll see if my neighbor will let me use her fruit cellar. Thanks again! Just made them, they are awesome! Thrilled to hear this, Janet! Mine turned out GREAT this year, too! 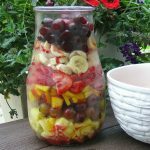 I see this was originally posted awhile ago, but just found it this cherry season as I searched for something to do with all the cherries we got this year. Just finished the whole process a couple of days ago. Super on their own and not as sweet as I thought they would be with all the sugar. I coated some in milk and dark chocolate – heaven!! You get a pop of sour as you bite into the morsel and then the sweetness of the chocolate comes through. 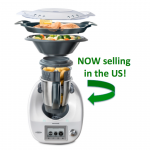 All tasters have raved about them. I highly recommend doing this. I seldom provide comments, but just had to this time – these are just that good. Thank you, Heather! I so appreciate you making and taking the time to chime in. It means a lot as this is a recipe I did develop on my own, inspired by how Connie does hers, but the result is very different. Like you, I also believe they are just that special. I would love to see a photo of your chocolate covered goodies. I use them so many ways. 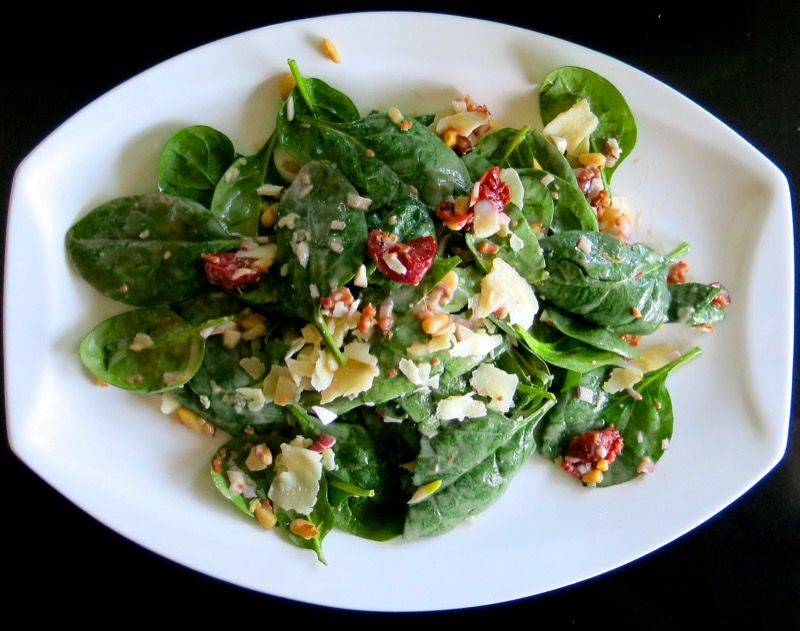 One of my favourite ways is in a baby wild arugula salad with toasted pine nuts – a simple olive oil and sour cherry vinegar dressing. 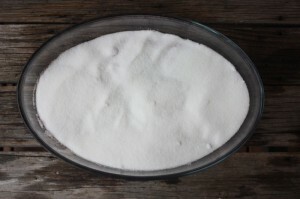 The vinegar is one of the bi-products… I add some sugar and give it as gifts as I get so much. People rave about that almost as much. 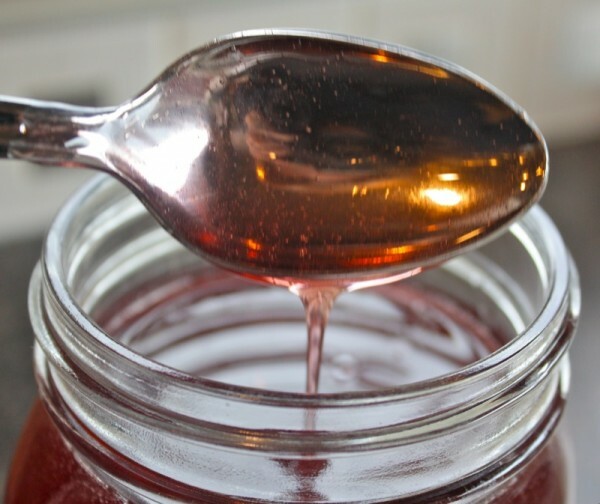 I started throwing away most of the syrup this year as it goes sugary in a couple of months and I just cannot find many uses for it. 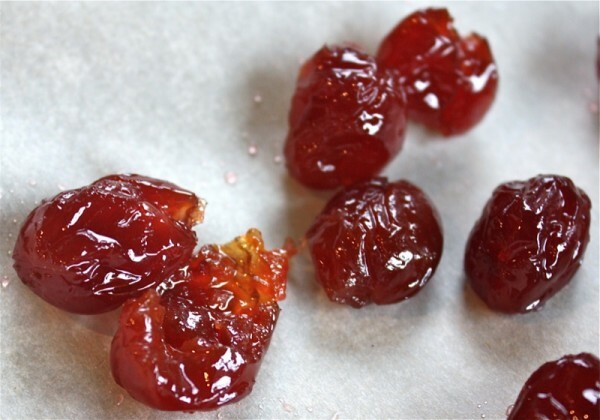 HI , I have made this recipe twice now and both times my cherry syrup has turned hard, almost into candy. It hardens and is unpourable. I wonder if I am simmering for too long? I am not boiling it high and I didnt think I was simmering for too long, but don’t know why this is happening? Ionly simmer until the sugar melts. That’s it. It takes very little time for this to happen, so it sounds to me like you are simmering it far too long. I have never had that issue. 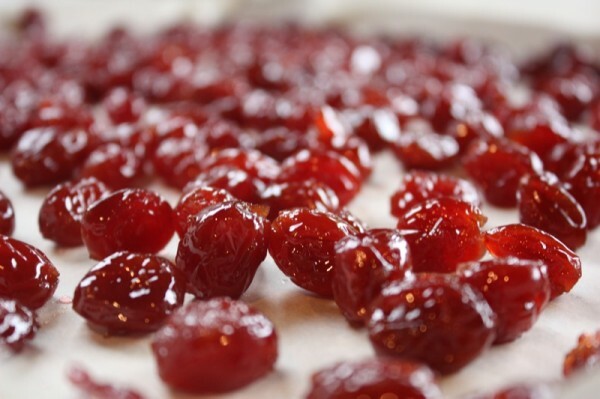 The idea is to get the cherries out of the syrup without any sugar crystals on them. This has been a no fail recipe until now… but I think that is your problem. Next time, keep this in mind. 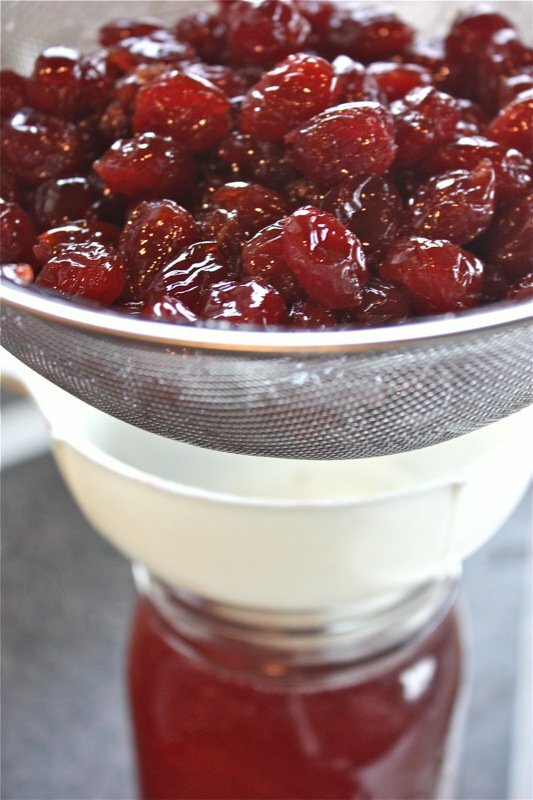 How do your cherries turn out? 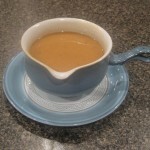 The syrup never really dripped off the spoon like you described, so I kept on simmering…..
Hope that helps…. and did say the only purpose of the simmering is to dissolve the sugar crystals. Once that is done, stop simmering. It won’t take long! Make sense? Valerie, thanks ever so much for the recipe. I’m almost to the bottom of my hoard from last year: I add a tiny jar to any cheese/ charcuterie board I serve. 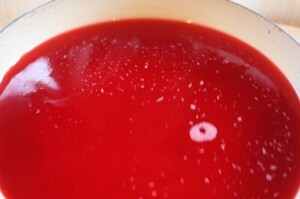 Last year, I mixed the syrup with rhubarb syrup, and added club soda to some of it; prosecco to some. Great either way, and a gorgeous late- summer drink. As for the vinegar: like you, I gave a lot of it for gifts. But then I discovered how good a tablespoon or two can be with sparkling water (kids gave hubs a sodastream for Christmas). Wish I’d kept more! Thanks for generously sharing this. You warm my heart, Carol! 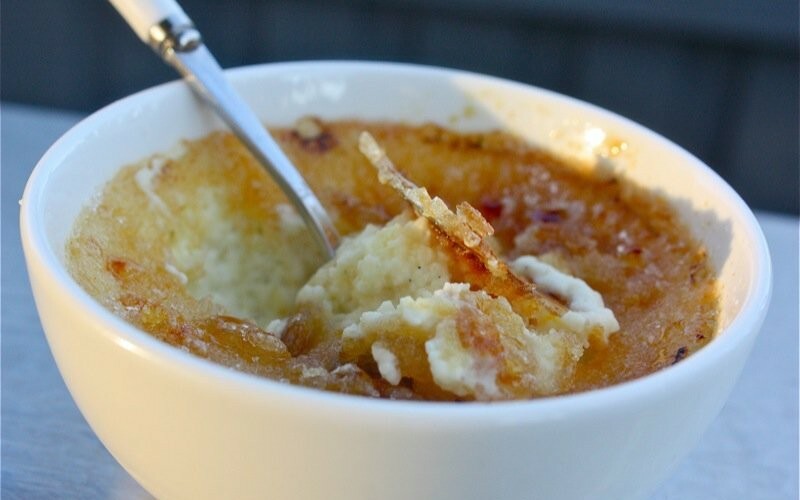 This is one of my most prized recipes on this site as it is so novel and (blush) so fabulous! I love it, too and am so happy you do. I love how the world works. Everyone’s best idea can always be made better by another. So, now, I get to try your ideas, too! That’s why I do what I do!